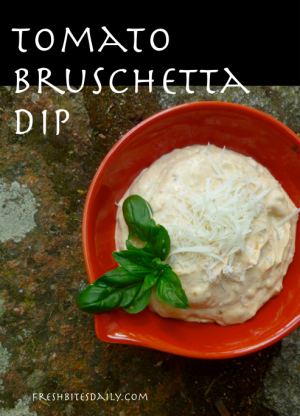 Inspired by a beautiful jar of tomato powder from our fall harvest, we whipped up this dip to take to a friend’s party. 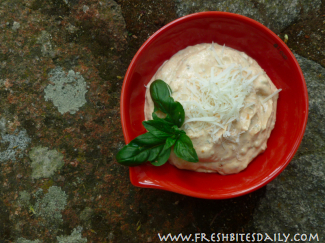 While it is a mix of familiar flavors combining tomato and basil, it is unusual for a dip. We set some aside and gobbled it long before the party started. We used dried tomato powder and basil but as you’ll see below, you can substitute dried tomato for the powder and fresh basil for the dried basil (with only a slight change to the process). Read our process for dried tomato powder here. Soften your cream cheese at room temperature so that it is easy to work with. Add your olive oil to a skillet over medium heat. Add water to the skillet to hydrate the tomato and basil until it forms the consistency of a watery ketchup. Whip your room temperature cream cheese with a wire whip. Add oil, garlic, tomato, basil, and water mixture to cream cheese. Mix well. Add sour cream until your dip reaches the desired consistency. Add lemon zest, grated cheese, and salt. Garnish with grated cheese and fresh basil if available. Ideally, make this dip a day in advance to allow the flavors to blend. The flavors will be nice for about three days though the dip can last a few days longer.